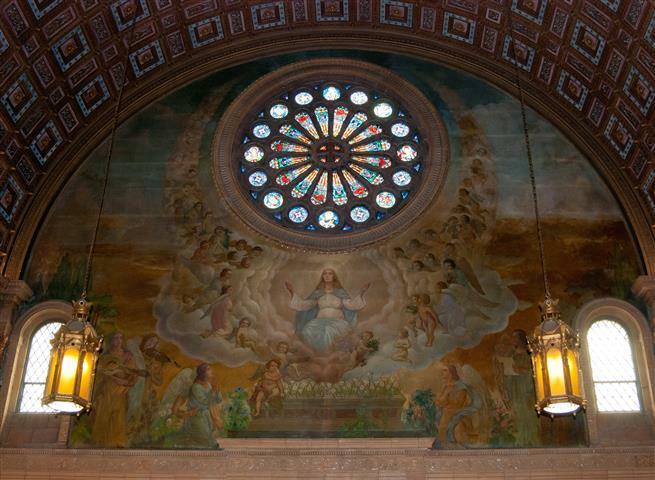 Much of the left (east) transept wall of Blessed Trinity Church is covered by this large painting of the Assumption of Mary into Heaven by Joseph Mazur. The theme of the artist’s rendering “is the crowning of [the] good life of Mary with heavenly joy; … the goal of every Christian’s life.” The painting parallels Mr. Mazur’s mural of the Ascension of Christ on the opposite transept. (Rev. Walter Kern’s Guidebook to Blessed Trinity R. C. Church, p. 45). Photo credit: Steve Mangione. Thursday, August 15 ~ at 8:00 p.m ~ Bingo will be played in St. Charles Hall. Saturday, August 17 at 8:00 p.m ~ Bingo will be played in St. Charles Hall. Monday, August 12 ~ St Jane Frances de Chantal ~ Communion Service at 11 a.m. 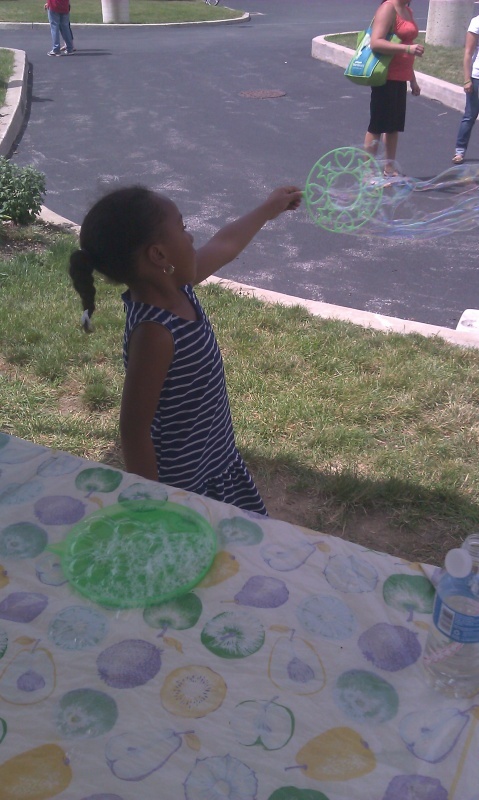 The Catholic Churches of Central Buffalo continued a tradition begun a number of years ago at St. Gerard’s by coming together for “Summer in the City,” a communal celebration of summer. the event took place on August 4 at SS. Columba-Brigid. Special thanks to Dan Korchowsky and Amy Johnson who coordinated Blessed Trinity’s participation. Summer in the City was a fine success. The weather was great – the music games and food (especially the desserts) were enjoyed by all. We are most grateful for the work done by Amy Johnson and Dan Korchowsky who attended all the planning meetings and coordinated our B.T. volunteers. Dan wishes to thank Elsieta Chapman, Angela Jost, Althea Porter, Sister Liz Savage, SSJ, Sister Claire Edwards, DC, Judy Casassa, Vontrese Draper, Martha Bobo and Jackie Korchowsky who helped with a variety of activities/jobs. And a word from Amy Johnson: “A BIG THANK YOU to our bakers and tent staffers. We were able to provide a tasty assortment of home baked desserts – 150 servings and all sold! I express special thanks to my team of Elseita Chapman, Althea Porter and Lucille Venezia who met last Sunday morning to cut, box and transport the baked goods to SS. Columba-Brigid. Our dessert tent was staffed by Sister Claire Edwards, Helen Roddy-Gray, Vontrese Draper and Judy Casassa who welcomed those of you who stopped by to lend a hand and socialize.” For more photos from Summer in the City, click HERE. Catholic League Appeal ~ A Tradition of Faith, Love and Sharing ~ Founded almost seventy years ago, we thank Almighty God for all the clergy and laity who pioneered the cause. The continuation of the League is now our mission and challenge. Help provide for a strong leadership in the Church of Poland. Your contributions are primarily used to support two seminaries where talented priests are sent for further studies to help provide strong leadership now and in the future—the Polish Pontifical Institute and the Polish Pontifical College, both in Rome. The priests return to Poland to staff Chanceries, seminaries, universities and works of charity. You would be impressed to see these zealous priests. This collection takes place the weekend of August 17-18. Project Homeless Connect ~ Sister Claire Edwards reports that as of August 4, we have collected just over 400 deodorants for the homeless people of our community. Because the goal is about 700, we will be extending the collection through August 18. The deodorant will be included in gift bags that will be distributed September 5 at the 5th Annual Project Homeless Connect. Baskets for donations are at each end of the altar railing at the front of church. Thank you so much for your wonderful response! Parish Council Elections ~ It’s time for Parish Council elections. There are four vacancies this year. You will find copies of a questionnaire in every pew, asking you to suggest someone in the parish that you feel might be a good candidate. Members of the nominating committee will take your suggestions seriously and contact the individuals you have selected to see if they would consider running for election to a three-year term on our Parish Council.